Running a rental business near Ronda can be very lucrative. The city of Ronda has always been an interesting site to visit for tourists. The direct surroundings of Ronda have become more and more interesting during the last few years. The bodegas with excellent Ronda wines, the Exquisite restaurants on the countryside, the extensive trails to follow, either on a bike, on horseback or on foot are just some of the activities that appeal to the visitors. For many the dramatic landscape, the history and the simple beauty of the landscape are sufficient to book a cottage and to relax for a week or two. Whatever the attraction, Tourism in the countryside is a growing business! And besides tourists, Ronda also attracts the brave ones who not only dream of changing their lifestyle but actually did it! Whether they have planted a vineyard and built a bodega or whether they have invested in an authentic tranquil guest house, they had the guts to dive into the deep and set an example for those to follow. Ronda is in desperate need of people following in their footsteps. Eco and eno tourism are growing. The Tourism department of Ronda states an increase of 60% in the last 7 years. The town invests heavily to give the visitors an unforgettable experience. Some of the events and activities organized can be found on the website Turismo de Ronda. The effort of the town and the local entrepreneurs makes tourism business in Ronda extremely attractive. An example is, for instance, this successful rental business near Ronda, property 186-00760P. A reformed Cortijo with 4 rental units, tranquil and peacefully situated at just 10 minutes from the city and the most spectacular views over the rolling hills with olive groves, towards the old Roman town, the Acinipo. Approximately 15 years ago the current owner took the big step and bought this dream location. The old Cortijo, the outbuildings and ancient old olive trees stole her heart. Once she set foot on this property she could picture her future. This is where she wanted to create guest facilities. This is where she wanted to put up a hammock, for her clients to wind down from busy lives in Northern Europe. 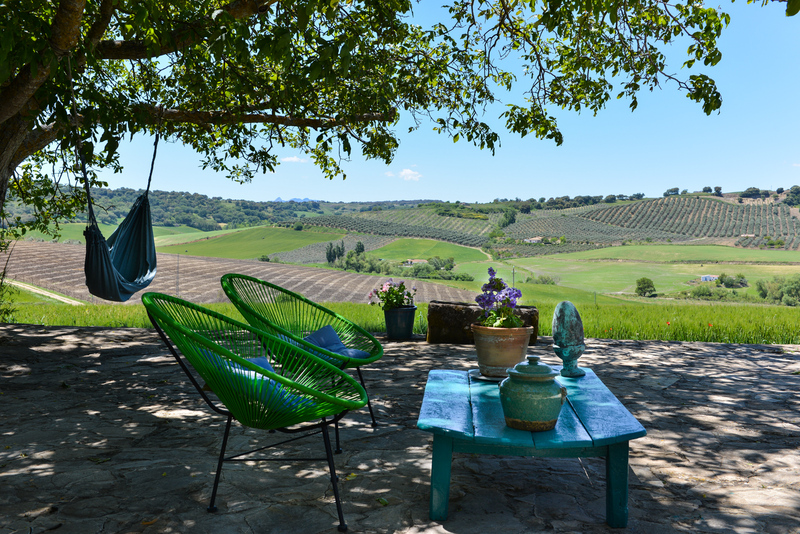 This is where clients can enjoy the luxury of silence and the endless views over the rolling hills with olive groves. This is where they can recharge the batteries! And, not to forget, this is where she wanted to start a life to enjoy all the above as well together with her family. She was right! Bit by bit she started doing up the main house and transforming the outbuildings into beautiful guest cottages. We have to admit, she has an eye for design and authenticity. She created outstanding rental accommodation. An exemplary project for barefoot luxury tourism. The cottages are spacious and light and beautifully decorated. Finished with high beamed ceilings, wooden shutters and lovely details as the ‘antique’ wooden stairs next to the contemporary painting on the wall. 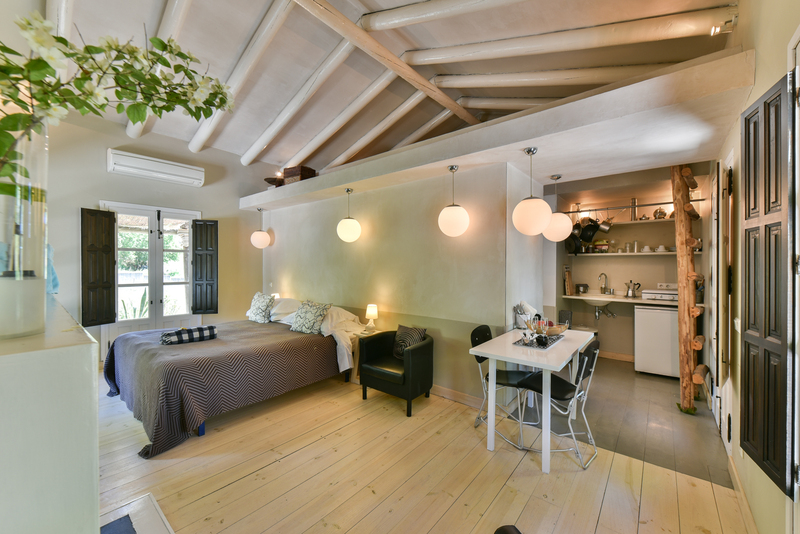 Antique is mixed with modern design, leaving a light and bright, very comfortable place to stay. Private terraces with lazy chairs finish it off. Clients are invited to wander around the premises and take possession of the land. Lovely cobbled steps lead to the pool area where you can see yourself spending the day with moving too far from your sun lounge. A little bar area in a shaded area, under the trees, invites to have a drink or a small snack, maybe chat with one of the other guests, before taking one more dive into the pool to finish the day. The finalized project has 4 separate rental units and a 2 bedroom owners Cortijo. Two of the rental cottages have a small lounge, kitchenette next to the bedroom with a bathroom. The other two are slightly smaller have a bedroom with bathroom ensuite and a small kitchenette. 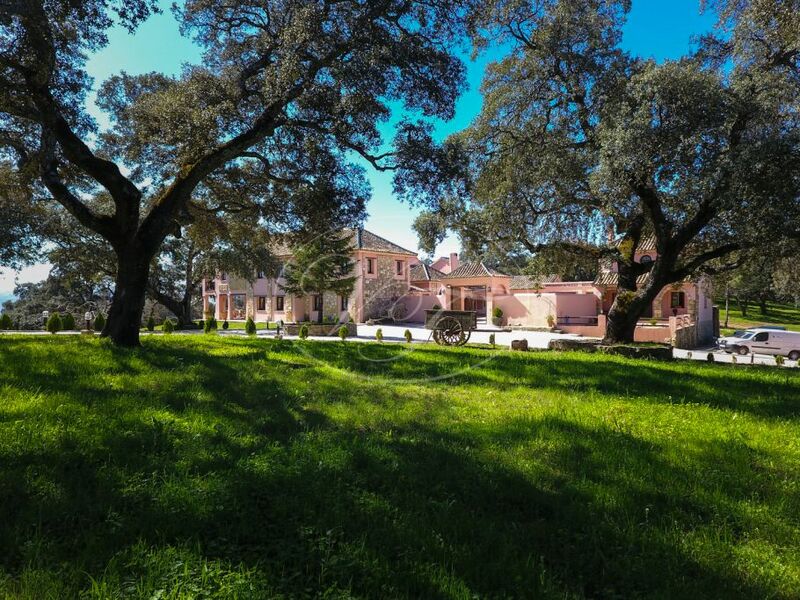 This unique rental business near Ronda has come for sale due to personal circumstances. The next owner who is looking to fulfil his or her dreams by running a guest house is a lucky one! All the hard work has been put in. It is a matter of taking over the keys, the website, the super positive reviews on different rental sites. This is an opportunity in a lifetime. The property can definitely provide you with an annual income. If you contact us via the contact form on the property page we will contact you to fill you in with the details. With regards to tourism in the Ronda area, according to Hosteltur, Ronda has 1.4 Mio visitors last years, in total good for 30 Mio Euros of income for the town. 25% of the visitors spend the night. The average occupancy rate in the hotels is 70%. In the first 8 months of 2017, they counted nearly 250.000 nights sold, 70% to foreigners and 30% to Spanish guests. Next to the towns impressive history, the setting of Ronda, the Serranía (mountain range) highly adds to this yearly increasing popularity. It is therefore noticed that guests extend their stay from the traditional 1or 2 nights to 4 of 5 nights, to truly explore the area and enjoy the relaxing environment. It is even not uncommon that clients book a fortnight and use the accommodation as a base to explore Andalusia. Looking at the facts and figures, we can’t say otherwise than that this is the time to purchase this interesting rental business near Ronda.